The picture was released in 1889. The title of the picture shows its source code – the depicted figures are characters in a literary work. Romantic poem by M. Yu. Lermontov “The Demon” was the fundamental principle for the artist in creating an expressive artistic composition. Pale face, unusual attire, powerful wings – everything speaks about an unearthly character. The young man “devilishly” is handsome – thin features, an expressive bend of eyebrows, a straight nose, tight lips. He observes the last minutes of Tamara’s earthly life, her soul is already leaving the body. The appearance of a young demon is not at all terrible and terrible – he sympathizes with a dying girl. Perhaps the young messenger of the underworld first encountered the death of an earthly man so close, besides not a simple person – this is her, Tamara, the Demon promised to make “the queen of peace.” And now it is all over: the girl is left with her strength, she imploringly pulls out her clenched hands in a wordless plea to a higher power. But prayers are not destined to be heard – the messenger of the darkness observes the last look of half-open eyes, dying breath. The faces on the icons, illuminated by a lamp, silently observe what is happening. Gloomy night background is consonant with what is happening. The picture is often compared with the more famous canvas by Mikhail Vrubel on a similar plot. However, a significant difference between the embodiment of demonic force is noticeable: the Vrubel character inspires fear, his dark figure is placed in the center of the composition, he is the main face of the plot. Makovsky’s demon is more like an ordinary young man, it contains quite human emotions. The image of Tamara is also resolved in different ways: the spectator of the Vrubel heroine does not see the face, her feelings and emotions are hidden by the artist, this is a minor character. Makovsky pays equal attention to his heroes – faces are open, what is happening is easily readable without words. 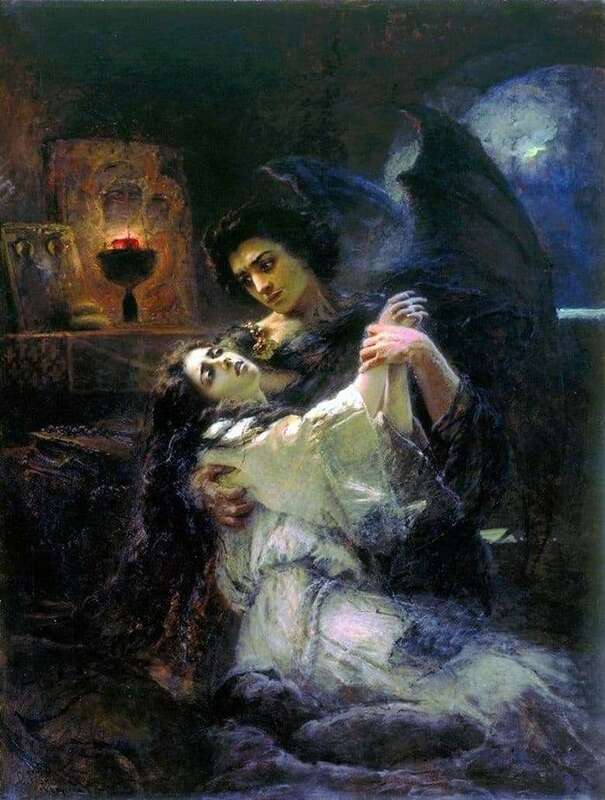 The high mastery of literary characters was highly appreciated – in 1889 the Tamara and the Demon was awarded the Grand Gold Medal at the Paris World Exhibition.